Liz Warren's 2012 "space-o'-lantern" features Curiosity rover. She writes: "Bobak Ferdowski is going to be in Houston late next week and I think it would be fun to give him the pumpkin!" For this year's "space-o'-lantern," veteran pumpkin carver and NASA employee Liz Warren honored what may be the biggest space event of the year: the Curiosity Mars rover. 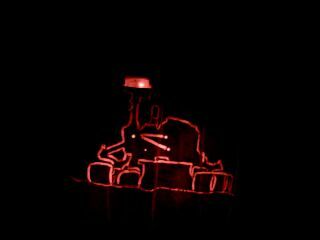 Curiosity landed on Mars in August, and for Halloween this year Warren carved a silhouette of the rover on a pumpkin. Warren has a longstanding tradition of carving space-themed pumpkins, which have usually honored space shuttle and International Space Station missions in the past. "I carved a Curiosity design this year because in August of this year, that mission truly captured the imagination of the world in bold NASA fashion," Warren told SPACE.com. "They dared a mighty thing and they succeeded." "The idea to carve a Curiosity pumpkin actually came from an astronaut familiar with my previous space-o'-lanterns," Warren said. "It's breaking a little with my tradition of featuring human spaceflight, but NASA's missions are broad and so I feel good about broadening the topic of my pumpkins." Curiosity is a $2.5 billion car-size rover that's beginning a two-year exploration of Mars' Gale Crater. The rover's nail-biting landing this summer, which went off without a hitch, captivated the public and marked a major success for NASA. One element of Curiosity fever centered on charismatic NASA flight controller Bobak Ferdowsi, whose stars-and-stripes Mohawk hairdo garnered overnight fame. "Bobak Ferdowsi is going to be in Houston late next week and I think it would be fun to give him the pumpkin!" Warren said. Liz Warren's Curiosity "space-o'-lantern" started with a paper template. Find a simple image of your pattern online. For her Curiosity pumpkin, Warren found a Curiosity photo from NASA's website. "Importantly, the design included the entire rover and the rover was all in the same perspective plane," she said. Set the image so it appears in black-and-white, high contrast, to help clarify the major features of the design to "help you decide what parts of the pumpkin to remove and what parts to keep. It is important to plan ahead before you start cutting!" Print out the image on paper and cut out the white portions of the design. Lay this template on the pumpkin and use a pen to trace along the cutouts. "For this Curiosity design, I actually didn't cut all the way through the pumpkin," Warren said. "I used tools to scrape away the skin to allow light to shine through from within. Sometimes, you have to scrape away a lot of the interior wall of the pumpkin to allow light to shine through. Ultimately, have fun: "Be patient, be flexible (sometimes you have to change your plans as you go), and have fun creating your Space-O'-Lantern!"